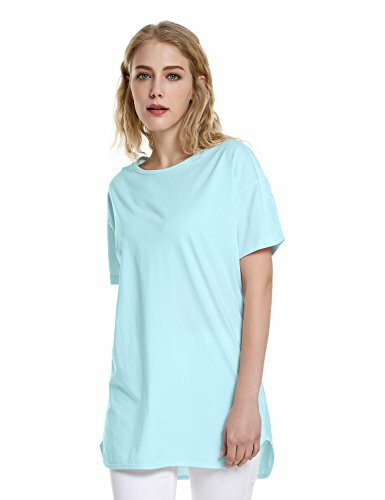 ZAN.STYLE Women's Casual Crew Neck Short Sleeve Long T Shirt Cotton Loose Tunic Tops Basic Plain Tee Shirt Plus Size Size S--Bust:108cm/42.52"--Length:81cm/31.89"--Shoulder Width:51.5cm/20.28"--Sleeve Length:15cm/5.91" Size M--Bust:112cm/44.09"--Length:83cm/32.68"--Shoulder Width:53cm/20.87"--Sleeve Length:16cm/6.3" Size L--Bust:116cm/45.67"--Length:85cm/33.46"--Shoulder Width:54.5cm/21.46"--Sleeve Length:17cm/6.69" Size XL--Bust:120cm/47.24"--Length:87cm/34.25"--Shoulder Width:56cm/22.05"--Sleeve Length:18cm/7.09" Size XXL--Bust:124cm/48.82"--Length:89cm/35.04"--Shoulder Width:57.5cm/22.64"--Sleeve Length:19cm/7.48"
Size S=US Size 12; Size M=US Size 14; Size L=US Size 16; Size XL=US Size 18; Size XXL=US Size 20. If you are between sizes, choose larger size. You can also check our size chart in description yourself to pick the right size. Thanks. We add 6 new colors to this t shirt.And make some changes in size and material for style 2. Please note. If you have any questions about this product by ZAN.STYLE, contact us by completing and submitting the form below. If you are looking for a specif part number, please include it with your message.